Aviator, mechanic and entrepreneur Lee Eyerly got into the ride manufacturing business after he saw how much more successful his pilot training devices were as carnival rides. The first ride he designed with the intention of selling as an amusement ride was the Loop-O-Plane in 1931 followed by the Roll-O-Plane in 1934. Even though he no longer manufactured pilot training devices, many of the rides Eyerly produced were meant to re-create the sensations of flying an airplane. The Roll-O-Plane simulated a half-loop, half-roll maneuver popularized by German fighter ace Max Immelmann in World War I. On each end of a long arm were two passenger cabins facing opposite directions. The cabins rolled as the arm rotated, keeping the cabin from turning completely upside-down. There was an Eyerly Roll-O-Plane at Lagoon for about 55 years, but they were not all the same ride. Three different Roll-O-Planes occupied a space at the park at different times. Below is the history of each one. The Roll-O-Plane was one of the first new rides added to the park when the Freed Brothers started managing Lagoon after World War II. Their first season bringing Lagoon back to life was successful and the several improvements were made the next year. New, modern buildings were constructed and shiny new Rockets replaced the old carriers on the Captive Aeroplane ride which swung out over Lagoon Lake. 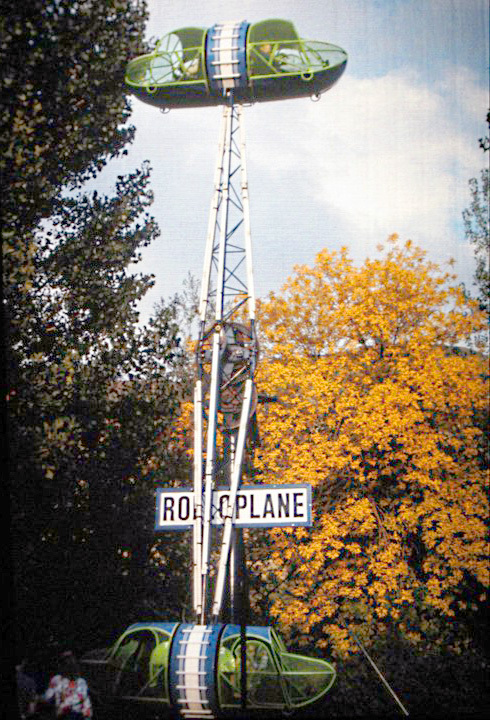 This first Roll-O-Plane would’ve been destroyed in a large fire at the park in November 1953. Roll-O-Plane illustration from a 1971 Lagoon brochure. After the fire ripped through the park, Lagoon was racing to rebuild and open on time for the next season. Multiple smaller rides were purchased to fill the park. Among the new rides, three were from Eyerly Aircraft — the Octopus, Rock-O-Plane and Roll-O-Plane. The Roll-O-Plane had a few different locations around the South Midway. At first it was just south of Rock-O-Plane, which was south of Roller Coaster. It was later moved to a location east of Roller Coaster and south of the Carousel and Octopus. Eyerly started making a Super Roll-O-Plane in the 1940s. 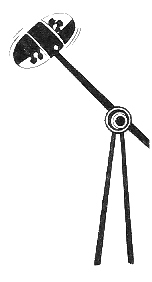 These updated versions would tilt to a horizontal position as the arm rotated. Eventually, this became the standard model and the “Super” prefix was dropped. This was the case at Lagoon as well. It was advertised as the Super Roll-O-Plane at first, but it was known simply as Roll-O-Plane ever since then. New rides announced in an April 1972 ad. It remains unexplained why the original Roll-O-Plane was replaced, but the Super Roll-O-Plane wasn’t the only new Eyerly ride that year. A Loop-O-Plane arrived at the same time and also had a name change later on. It was first known as the Hi-Jacker and then The Looper, but it’s probably best-remembered by a nickname given to it by guests – The Hammer. When it opened, the newer Roll-O-Plane was placed directly across from Rock-O-Plane to the west where Wild Mouse is now. In 1973, the New Wilder Wild Mouse opened in that spot and Roll-O-Plane moved to the south of Rock-O-Plane, positioned diagonally since the Midway ended at that point. When the Sky Ride opened in 1974 extending the Midway a little further south, Roll-O-Plane was turned to face directly west as it would remain from that point on. Sadly, in June 2002, even though the ride had been rebuilt three years earlier, metal fatigue caused the arm to bend during the ride cycle when it was rotating horizontally. No one on the ride was injured. The ride was quickly removed and it was uncertain at first if it would be repaired. Later, parts of it could be seen in the park’s north bone yard and a planter took its spot on the Midway. Today, the area has become one of eight designated smoking areas created to comply with the county’s outdoor smoking laws. 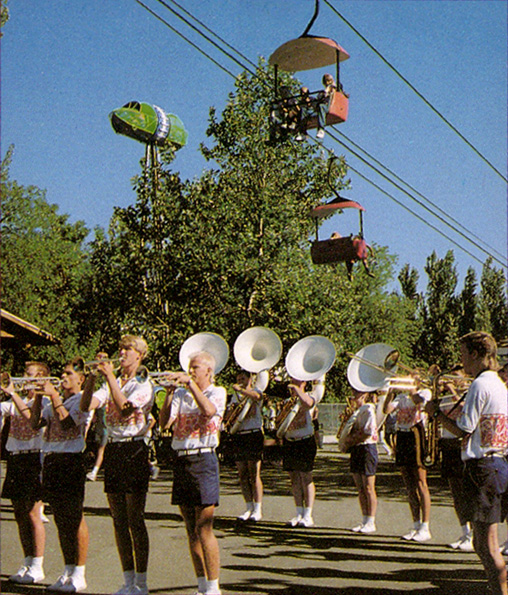 This photo from a 1980s park brochure shows Lagoon’s marching band performing with Roll-O-Plane and Sky Ride in the background. Many Improvements At Lagoon Funspot. The Billboard, 12 Apr 1947. Lagoon Resort Slates Opening Saturday With New Rides, Games. Deseret News, 5 May 1954. Eyerly Aircraft Company Catalog, 1978. Arave, Lynn. Mishap grounds ride at Lagoon. Deseret News, 3 Jul 2002. Sherman, Stephen. Max Immelmann. AcePilots.com, 2012. Roll-O-Plane. Lagoon Is Fun Forum, 17 Oct 2013. Lee Eyerly. Salem Online History, accessed 12 Jul 2016. Email to author from Craig Burda, NAPHA director, 23 Jan 2011. Email to author from Jim Abbate, NAPHA, 24 Jan 2011. Email to author from Jim Futrell, NAPHA historian, 14 Mar 2011.